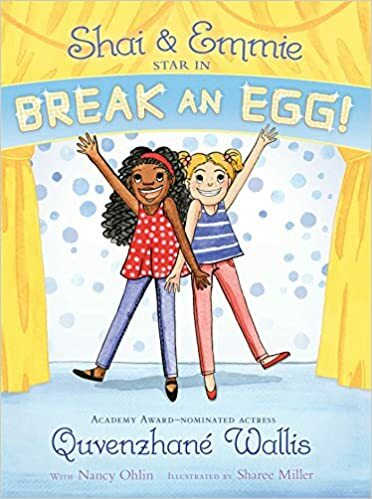 Summary: Best friends Shai and Emmie are third graders at Sweet Auburn School for the Performing Arts. When snooty new girl Gabby gets the part Shai wanted in the school play, Shai is crushed. Gabby struggles a bit with her role, and Shai is hopeful that she’ll be asked to step in; instead, her teacher asks her to coach Gabby to do a better job. Shai learns what it means to take the high road, and she and Emmie find ways to both help Gabby and (sort of) become her friend. Opening night goes off without a hitch, and Shai feels proud of both her performance and the way she has handled a difficult situation. Book 2 in the series is due out in January. 128 pages; grades 1-4. Pros: Teen actress Quvenzhane Wallis brings her insider knowledge of the performing arts to this early chapter book series. Readers will enjoy the drama both onstage and off as the class learns to works together to put on their big show. Cons: Pulling together a third-grade performance of Once On This Island in four weeks seemed ambitious even for a performing arts school. 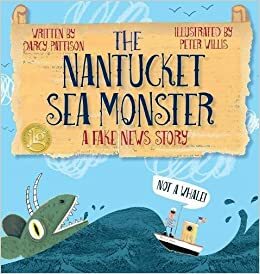 Summary: August 4, 1937: Two men claim to have seen a sea monster off the coast of Nantucket. The local newspaper reports the story, and before long, other witnesses come forward and describe a similar monster. A few days later, five-foot long footprints are discovered on the beach. Scientists at Harvard and the New England Aquarium study photos of the giant prints, while newspapers across the country pick up the story. Two weeks later, word spreads that the monster has been caught. When people rush to see it, they can’t believe their eyes. The “monster” is a huge rubber balloon, designed by master puppeteer Tony Sarg for the Macy’s Thanksgiving parade. It had all been a publicity stunt, with news reporters in on the hoax from the very beginning. The float flew in the 1937 parade and was seen by millions more people; Nantucket got tons of free publicity. Includes a timeline and two pages on the ethics of fake news. 32 pages; grades 2-5. Pros: A fun story that also has a timely message about the responsibilities of a free press; this would be a great catalyst for a discussion about today’s fake news. 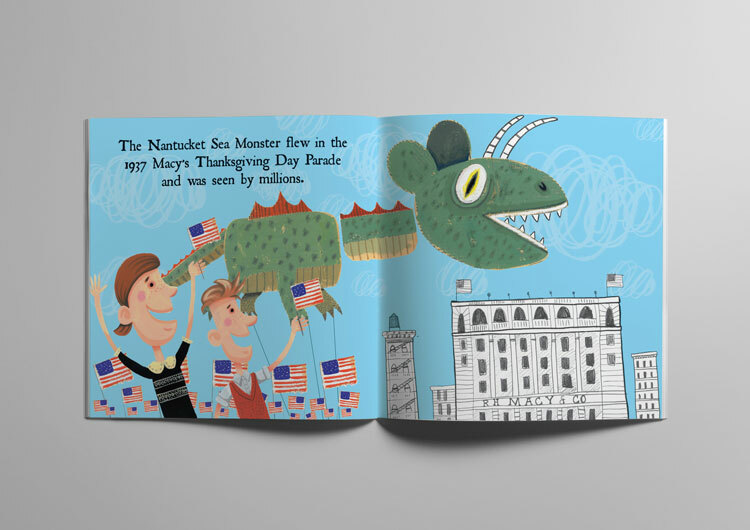 Cons: I was skeptical that the monster could be as goofy-looking as the illustrations showed. As you can see from the photo, it actually was. Hard to believe. Summary: When a single snowflake lands on a fox’s nose, the fox is unsure about how to handle the coming winter. He gathers advice from other animals, but hibernation and migration options don’t work for him for one reason or another. 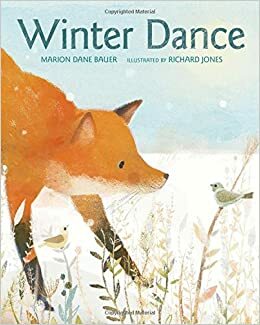 At last he meets another fox, and as snow begins to fall, whirling in the wind, the other fox shows him how they can dance together. 40 pages; ages 4-8. Pros: Muted illustrations perfectly capture the feeling of late fall and early winter. 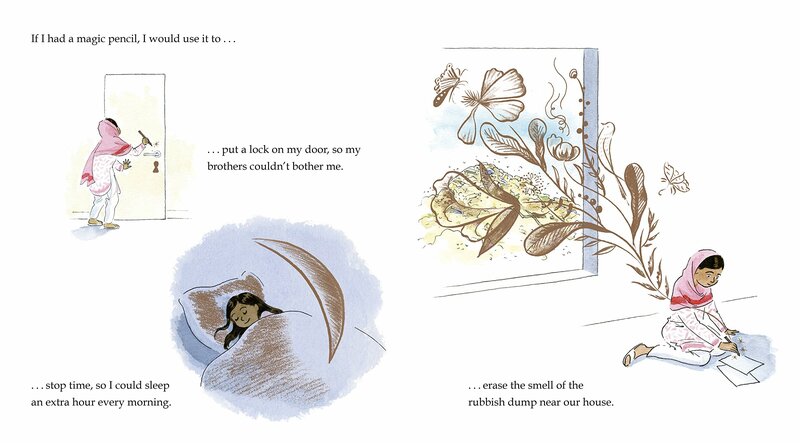 The repeating text will help kids learn more about how animals survive the cold weather. Cons: It would have been nice to see some back matter explaining more about animal behavior, and especially about the foxes’ dance. Summary: When Saul Ramirez was hired as the art teacher at Henderson Middle School, he promised the principal he would also produce a championship chess team. Growing up in El Paso, the poorest zip code in America, Ramirez had been a state champion in high school. His 2014 team came in second at the Texas championships, only to have a disastrous trip to nationals. Many of those kids went on to high school, leaving Mr. Ramirez with a young, inexperienced team in 2015. Much of the book focuses on those twelve sixth and seventh graders who worked for hours after school and on weekends that year to learn to play well enough to make their dreams come true. Their roller coaster year through local tournaments, the state championship, and a triumphant national championship showcases Ramirez’s can-do spirit in an impoverished school made up mostly of immigrant kids from Mexico. 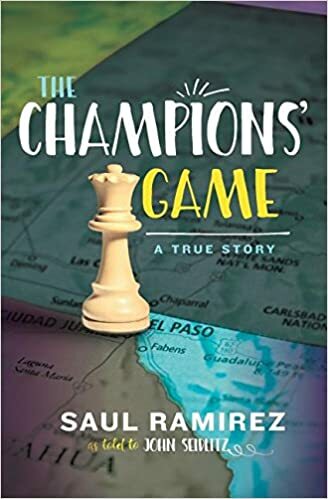 Each chapter title is a rule for chess that also applies to life, and Saul Ramirez makes sure that all the players on his team learn as much about succeeding in life as they do about chess. 194 pages; grades 5-8. Pros: This reads like an underdog movie, with a scrappy, unlikely team of young middle school students succeeding through their own sheer determination and that of their eternally optimistic teacher. Even non-chess players like myself will find plenty to enjoy and cheer about. Cons: The hardcover’s $21.99 price tag. Summary: A boy and his father spend a day at home making pizza. They start in the garden, picking tomatoes, carrots, onions, basil, and a pepper. Then it’s into the kitchen to make the dough and the sauce. Both items have to rest awhile, so father and son head outside to play. Later, the boy “wakes up” the pizza ingredients, and he and his dad put them together, add some toppings, and send their dinner to the oven to bake. While they’re cleaning up, Mom gets home from work, and the day ends with a delicious dinner. Includes recipes for dough and sauce, and instructions on how to assemble and bake your own pizza. 40 pages; ages 3-6. 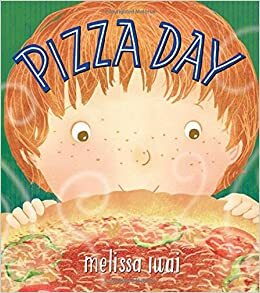 Pros: A companion to Melissa Iwai’s Soup Day (which may be more appropriate for this time of year), this simple story celebrates family and fresh food. The acrylic illustrations have plenty of kid appeal, and will whet appetites to try the recipes at the end. Cons: That pizza definitely needed more cheese. Summary: Edson Arantes de Nascimento grew up poor in Brazil, tutored in soccer by his father who had missed out on a professional career because of a knee injury. From a young age, Edson adopted the nickname Pele, and that was how he was known to millions of fans as he rose to the top in the soccer world. As a member of the Santos team, he became unstoppable, becoming the only player to ever win three World Cups. He retired from Brazilian soccer in 1974, but financial difficulties led him to sign with the New York Cosmos two years later, causing a brief rise in the popularity of the game in the U.S. Since his final retirement, he has traveled the world as a goodwill ambassador and worked with the Brazilian government to improve sports in his own country. 144 pages; grades 4-8. 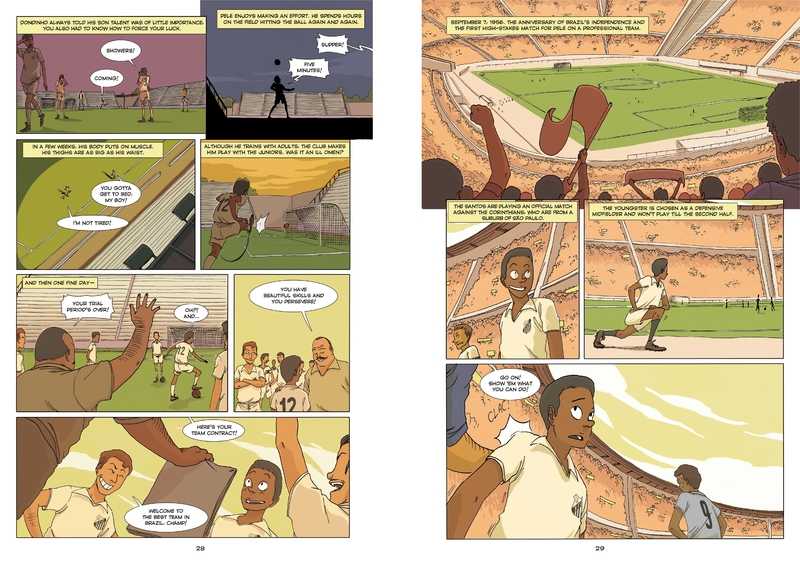 Pros: A fast-paced graphic novel that will grab the attention of sports fans. 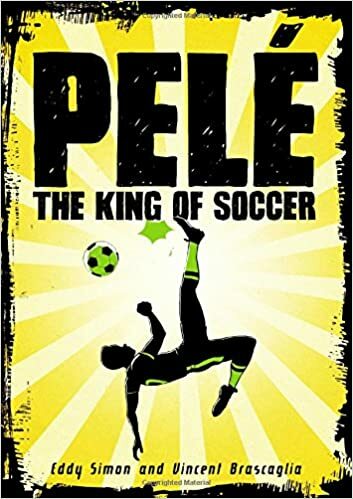 There’s plenty of soccer action, as well as biographical information that doesn’t shy away from some of Pele’s less admirable traits, including adultery, but ultimately portrays him as a positive role model. Cons: The font for some of the footnotes is so tiny as to be almost invisible to the naked eye. Summary: Malala Yousafzai describes how she used to watch a TV show about a boy who had a magic pencil that could create whatever he drew. She wished she could have one so she could draw a lock on her bedroom door, new dresses for her mother, and a soccer ball for her brothers. 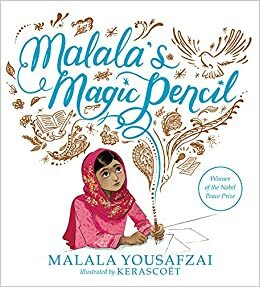 As she grew older, her dreams grew too, and soon she wished she could use her magic pencil to erase the poverty she saw around her. She worked hard at school, and when “powerful and dangerous men” took over her country, she started speaking out about the importance of letting girls attend school. With white letters on a black page, Malala states, “My voice became so powerful that the dangerous men tried to silence me. But they failed.” The accompanying illustration shows her looking out a hospital window. The last few pages show her continuing her work today, writing, demonstrating, and speaking at the United Nations. Back matter includes a letter from Malala, a page of biographical information, and three photos of her at different stages of her life. 48 pages; ages 5-8. Pros: A moving introduction to Malala Yousafzai’s courageous story, beautifully illustrated with ink and watercolor drawings. Kids looking for more information can move on to the young reader’s edition of I Am Malala. Cons: You didn’t really think I was going to write something negative about a book by Malala on Thanksgiving Day, did you?